Did you know that 88% of GCs surveyed by ACC in their 2014 survey say that ethics and compliance are their biggest challenges? To me ethics is the ‘soul’ and compliance is the ‘process to demonstrate adherence’, particularly when under investigation by any appropriate authority. Please see Appendix 1 for a specific booklet on corporate governance best practice for in-house lawyers. For this Report I am concentrating on ethics, because each business sector/organisation has its own compliance regulations and challenges so it is not possible for these to be meaningfully collated within one blog. In fact the Legal Exchange Network found in 2013 that 60% of their survey respondents were reviewing and upgrading their compliance programmes. Further this survey established that instilling a compliance culture was recognised as the second top priority. So how can in-house lawyers influence the culture of an organisation? Clearly they must start with their own visible behaviours and become leaders here. There are two key words I use here – Define and Deliver. Step 1 – Ethics – what does this mean? Moral Principles that govern a person’s behaviour or the conducting of an activity. There are various organisations that have guiding principles but what do these really look and feel like in everyday corporate situations. The Co-operative Bank started to debate and discuss this at senior levels around 1998-2001. We all agreed we wanted a practical solution to define ethics that al could subscribe to. I am going to share my own in-house experience of this important part of our internal ‘hats’ within an organisation in a way that will be realistic for you and your team. I considered myself lucky when I worked for the Bank that we had this ‘Ethics in Action’ competency within the family of behavioural competencies that we took seriously. This meant that the business and legal were working together to ensure that the Bank lived up to its published Ethical Policy, which it had successfully launched in the early 90’s. Below I have specifically tailored the Bank’s Ethics in Action competency for a legal team. This may give you some ideas about the ‘behaviour set’ you are considering for in your own team. It is clearly not aimed at our professional ethics, which are contained in the 10 Mandatory Principles and in the 12 chapters of the Code of Conduct. I have added in Appendix 1 the list of 10 Mandatory Principles. If you prefer you could not use these as a base for your internal deliberations on defining what they mean for you and your team in the context of the organisation culture of which you and your team are working for. Takes a stand and continues to act ethically even where there is personal risk. The main purpose for this set of behaviours at this level is for your technical experts to build trust and respect both internally and externally, and become the coveted trusted adviser. Remains open and ethical when faced with difficult decisions. Asks for help when does not know something or how to prioritise conflicting work demands. As you can see at the heart of this competency is concern about our impact on others, and a guide as to what steps we needed to take to demonstrate this. So how did we use this behaviour to build and maintain our ethics? To reiterate the Co-operative Bank operated a competency framework, which was mapped, lived, measured and updated at the time I was there. So the whole organisation was used to understanding and appraising competencies. For example in all commercial projects undertaken, all project members (including legal) would be assessed against certain agreed competencies for that project. This may or may not be true for your organisation. Our experience of achieving organisational performance was through focussing and reviewing individual capability and potential. Should your organisation have its own competency framework then this would be an appropriate base to ascertain whether you wanted to add this competency you’re your department. If you are starting from scratch on competencies then there is full set of competencies for in-house lawyer that was developed with the Law Society Commerce and Industry Group in the 90’s. These are set out in my book – Managing External Legal Resources – (co-author, Richard Tapp Legal Director and Company Secretary Carillion PLC) should you want to expand or engage your team on defining and delivering on a wider competency framework. Which ever set of competencies you decided to start with, I would strongly recommend that at an appropriate internal team meeting(s) a set of behaviours is discussed and shaped by the team members themselves. If your support staff were not normally included in team meetings then I would recommend that you give them an opportunity to participate in the development of the legal team’s ethic competency that is right for you and your department. This is particularly apt given the diverse experiences, philosophies, religions and education of the workforce in today’s multicultural society. These discussions should include any organisational principles or values, any regulatory code imposed on the organisation itself. This would facilitate you and your team discussing synergistic energy between these different systems. You could circulate the Ethics in Action competency above and use this as a base to establish which ones you and your team want to adopt. When I have introduced competency-based framework into a team, for the first year I have recommended that only 3 behaviours be adopted per level. At the end of the first year, you and your team can review what worked really well and what can now be added or changed where appropriate. 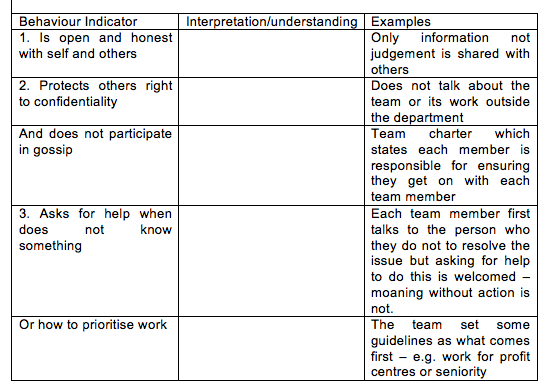 If you wanted to set your own ethical behaviours I set out an example table discussion exercise below, which can be used as a starting point to explore these with your team. Each participant would write down their own ideas in the middle column, as it is important that everyone can see the different perspectives. If there are widely different views then you will have to decide on whether to set one that people can mainly live with or spend the time getting an agreed one. Part of the defining process may be identifying which behaviour within the ‘Ethics in Action’ group above applies to each level within your department. Further Bank senior executives had to be able to demonstrate the level 2 and 3 behaviours before being rated against Level 1. Here visible role models actively ‘living’ the competency behaviours are critically important. It can also be useful to identify examples. I have made some suggestions in the examples column. It is important to have some form of measurement/tracking system to ensure implementation and continual refinement/improvement. Again this may depend on what is currently used by the organisation or the legal team may specifically design it. This may be an internal measurement for the team before engaging the business or you may measure this with your clients. As mentioned earlier, at the Bank we included the behaviours in our customer feedback for projects. You could add specific behaviours from your Ethics in Action for significant individual transactions. You and your team could then agree with the business whether the legal team focuses on the least scoring behaviour/skill or developing their strengths in this area. Once the mechanisms for measuring are agreed then you can move to the trial stage of implementation. Depending on the size of your team and/or the culture of your organisation then you may instigate a pilot to assess what works and what does not. These can be shared at your team/departmental/business meetings and it is a good idea to focus on the successful ones to embed best practice. Recognising and rewarding these ‘successes’ at team/departmental meetings or even with the business is also a critical part of implementation. The rewards can be chocolates/champagne or whatever is appropriate for your department! In the Bank their Ethics in Action competency was part of the formal appraisal system, and there was a monetary value attached to the progression of delivering against all the competencies including this one. I recommend that you do initiate a discussion of ethical behaviour that is suitable to your legal team in delivering a robust legal service to the business. This is best conducted before any questions arise on what is ethical behaviour or not by legal or the business. How you conduct this enquiry to define and deliver ethical behaviour will depend on a number of variable factors. I trust that you will find something in this report that will assist you on this quest. Any questions or comments on this blog to ann@managingexternallegalresources.co.uk. 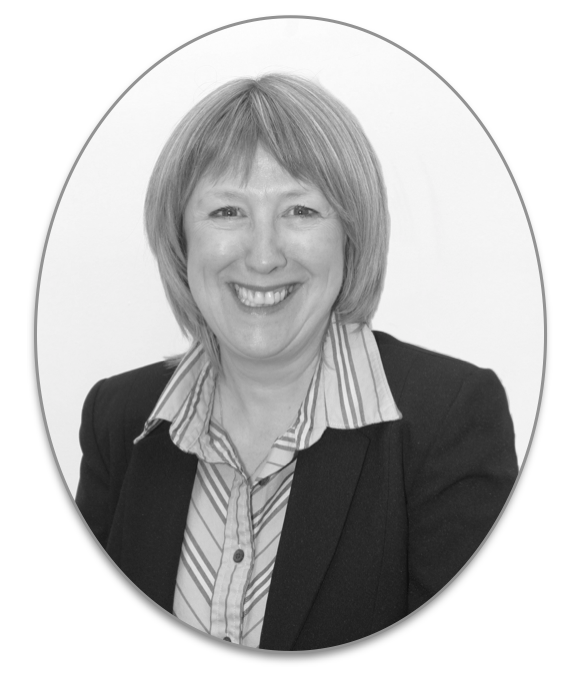 This is my specialist websites dedicated to in-house lawyers offering strategic coaching, leadership, management and interpersonal skills training. I also deliver team away days as well as facilitation process meetings for in-house teams. *Competency and competencies are used interchangeable. These are defined as the behaviours that employees must have or must acquire to input into situations in order to achieve entry level to high levels of performance. ** The definition of feedback that I use is that it is neither praise nor criticism just observed precise objective information that the individual can use to inform their future behaviour. ***It is important that the lessons learnt today about the banking sector as a whole, and the Co-operative Bank in particular is understood in this context. Mainly, that when Ethics are not continually ‘lived’ within the leaders and senior management then the results can be devastating to the organisation (and sector), both financially and reputationally. Reconciling the Irreconcilable – Best Practice Guidelines for In-house Lawyers, which was written, by Ann and members of the corporate governance team for the Law Society Commerce and Industry Group with Wragge & Co in 2005. Clearly, you would have to be mindful of legal and regulatory updates since it was written. Again, you would have to be mindful of legal and regulatory updates since it was written. This disclaimer governs the use of any report provided by Ann Page, Beyond the Brief Limited via any website. By using this report, you accept this disclaimer in full. This disclaimer was created using an SEQ Legal template. The copyright in this report belongs to Ann Page (Beyond the Brief Limited) and contains information relevant to in-house lawyers. This information and report is not advice, and should not be treated as such. To the maximum extent permitted by applicable law and subject to section 6 below, we exclude all representations, warranties, undertakings and guarantees relating to the report. The limitations and exclusions of liability set out in this section and elsewhere in this disclaimer: are subject to section 6 below; and govern all liabilities arising under the disclaimer or in relation to the report, including liabilities arising in contract, in tort (including negligence) and for breach of statutory duty. We will not be liable to you in respect of any business losses, including without limitation loss of or damage to profits, income, revenue, use, production, anticipated savings, business, contracts, commercial opportunities or goodwill. If a section of this disclaimer is determined by any court or other competent authority to be unlawful and/or unenforceable, the other sections of this disclaimer continue in effect. If any unlawful and/or unenforceable section would be lawful or enforceable if part of it were deleted, that part will be deemed to be deleted, and the rest of the section will continue in effect. In this disclaimer, “we” means (and “us” and “our” refer to) Ann Page and Beyond the Brief also trading as Managing External Legal Resourceswhich has its principal place of business at Rochester Wynd Leeds LS 71 8 XU.